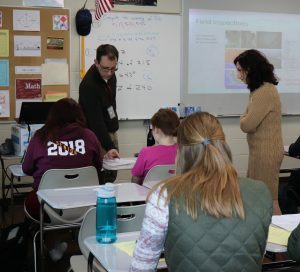 Iowa State University’s Institute for Transportation (InTrans) research scientist Basak Aldemir Bektas went to Ankeny High School teacher Joe Carey’s AP Statistics class this week to help his students learn to PANIC. That is, Carey aimed to teach his students about confidence intervals using the PANIC steps of stating their Parameters, stating their Assumptions, Naming their interval, identifying that Interval and coming up with a Conclusion. Bektas assisted in that important endeavor by offering a real-world experience and example from her recent research with Brent Phares and Zachary Hans into what bridge, land use, and species’ distribution factors are more likely to make a bridge a roosting habitat. The classroom visit was the final part of Carey’s work at InTrans for the past two years as part of ISU’s Research Experiences for Teachers program that provides high school teachers with opportunities to do research and build relationships with professionals in the Science, Technology, Engineering and Mathematics (STEM) fields. Carey said his work at InTrans reminded him to keep perspective about the importance of the learning process. With background from Bektas about the project and its importance — to protect endangered bats while ensuring necessary bridge repairs can be made with fewer delays — Carey gave his students a variety of bridge factors and the observed numbers that housed bats. Their job, then, was to assess the likelihood of each factor being a bat habitat. The students’ work mirrors one small part of the actual research that helped determine correlations between various variables and bat roosting behavior. Bektas, for her part, was eager to join the students — this is her second year visiting Carey’s class — to help inspire their interest in the STEM fields. “This project, with its unique and interdisciplinary nature, gives us the perfect opportunity to get students’ attention and engage them in the discussion. I was honored to work with RET and Joe Carey the last two years, and I believe some of the students we reached out to are now more interested in studying engineering in future,” Bektas said. The RET program, hosted through ISU’s Center for Biorenewable Chemicals and funded by the National Science Foundation, will continue in 2018, between June 11 and 27. Those interested in applying can do so here. Applications are due by March 1.